New York, NY ~ There are two places in America where people go to chase their dreams, New Jersey isn’t one of them. So if by any chance you aren’t in love with the palm trees in Los Angeles, New York City would be your best bet. 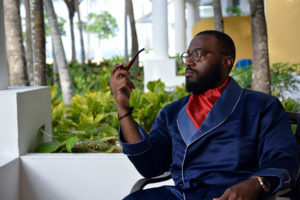 If you’ve ever been to the concrete jungle, you would know that fashion trends sprout up in NYC like grass in the spring…so when you see ascots on an NYC syndicated sports radio show, I guess you shouldn’t be shocked. Over the last 4 months, Sterling Ascots were popping up around a few necks on national television, ESPN to be exact. Whether it was ESPN SportsCenter or ESPN Monday Night Countdown, we’re naturally happy to see ascots trending on television, especially our ascots. To be included in national broadcasts shot in Los Angeles, North Carolina, Connecticut, etc is a great feeling. However, coming back full circle to the New York City market with our ascots has been one of the more fulfilling experiences for us thus far. 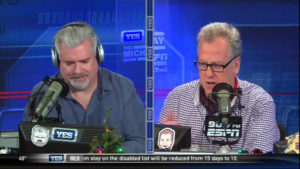 Before I go any further, I would like to thank Michael Kay, Don La Greca, and Peter Rosenberg from the Michael Kay Show on 98.7FM ESPN Radio NY (syndicated on the YES Network, home of the Yankees). On from Monday to Friday (3pm to 7pm) for your afternoon driving pleasure, Michael Kay was kind enough to showcase a couple of our ascots on two separate shows between November and December. At the beginning of the 2016 NFL season, Michael Kay was not a fan of ascots at all. 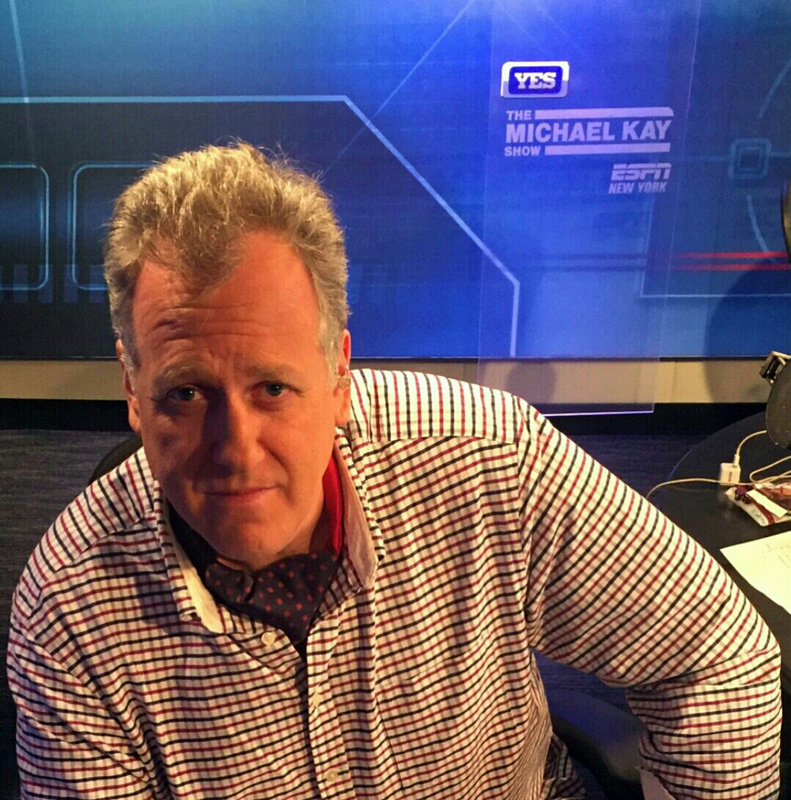 To paraphrase ‘ascots and bow ties are repug(nant)’ – Michael Kay, in response to a question posed by Don La Greca after the station’s weekly spot with Steve Young. 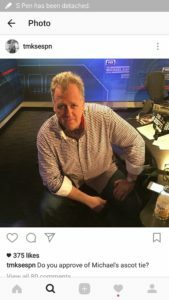 After hearing a number of comments filled with disdain towards ascots on a weekly basis, we never thought we’d see the day where ascots would touch the ESPN Radio or YES Network platform. 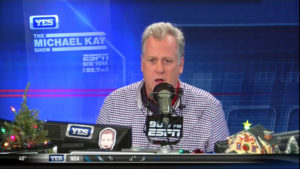 However, following a weekly Steve Young segment, Kay joked about wearing an ascot upon meeting him at MetLife Stadium for a face to face broadcast. After some lobbying by Sterling Ascots to Kay and Peter Rosenberg, Kay gave in to the ascot phenomenon. 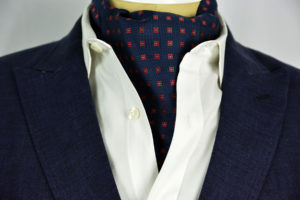 Kay agreed to wear the ascot but explained that he would wear it for a segment or two but wouldn’t promise anything beyond that. Turning a joke into reality, Kay also announced that he would wear an ascot upon meeting with Mr. Young in honor of ascot enthusiast and ESPN NFL Monday Night Countdown co-anchor: Charles Woodson (as seen in our last post https://sterlingascots.com/charles-woodson-brings-sterling-ascots-to-espn/). After correspondence with the Kay show cast, all three members of the cast received their own individual ascot package. The day he received his ascots he immediately wore one on air. 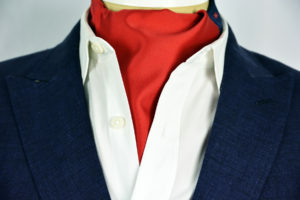 The first ascot to hit the YES Network/98.7 ESPN NY Radio airwaves was the Checker Red side of the Ruby Red Reversible Sterling Ascot. 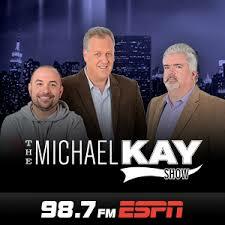 Join us next time for part two to our Michael Kay in Ascots Saga from MetLife Stadium. Until then enjoy free shipping on all Sterling Ascot purchases until 2/1/2017.